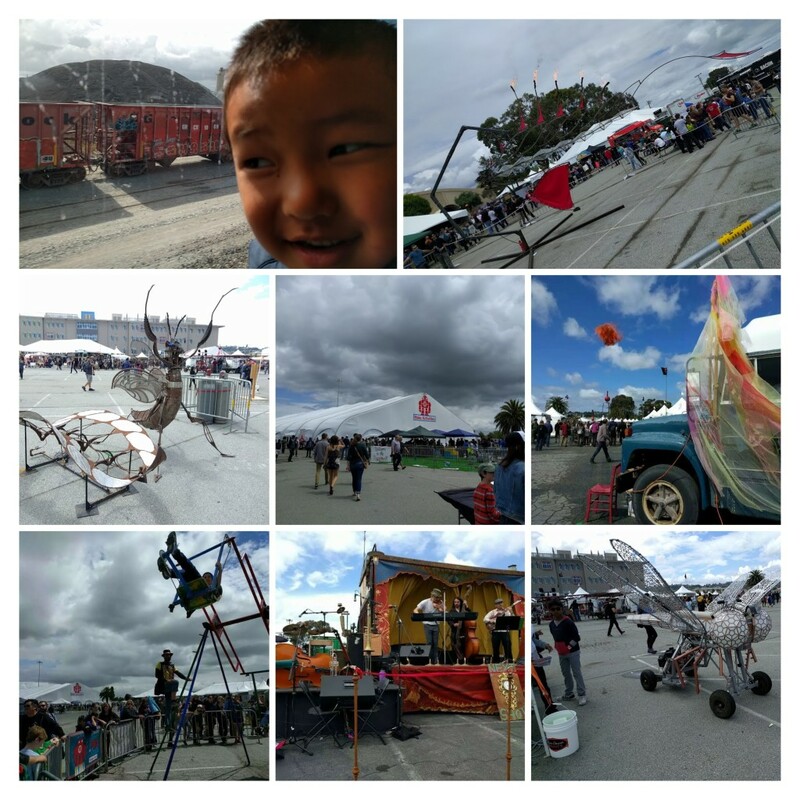 We took Noah to Maker Faire on Saturday (5/21/2016). It was the first time for all of us. We decided to park at S. SF Caltrain station and took the train south to Hillsdale station. Mainly because Noah wanted another train ride. It turned out to be not the best choice of transportation. We will opt for driving and then shuttle instead the next time. S. SF Caltrain station has probably the worst road signage we’ve ever experienced. We drove around in circles three times before we finally decided to take the unmarked entrance. Coming from San Francisco, exiting from Grant Ave. left at the end of off ramp, and then left at the first light (Marked as Grant Ave.), THEN, took the first left, follow the unsigned road to the station parking lot right underneath the overpass. Walking from Hillsdale station to San Mateo Event center is actually pretty long, approximate 12 minutes. It was okay in the morning. It was a complete nightmare at the end of the day when everyone, especially the little guy was dead tired. We took the 9:31am train from SSF(turned out to be 5 minutes late). 90% of the seats were taken, but we managed to find some empty ones that were reverse facing (the last coach). Arrived at the door around 10:15am. It was a little overwhelming for us since we had no idea what it will be like. There were booth that were shooting flame into the air right by the door. 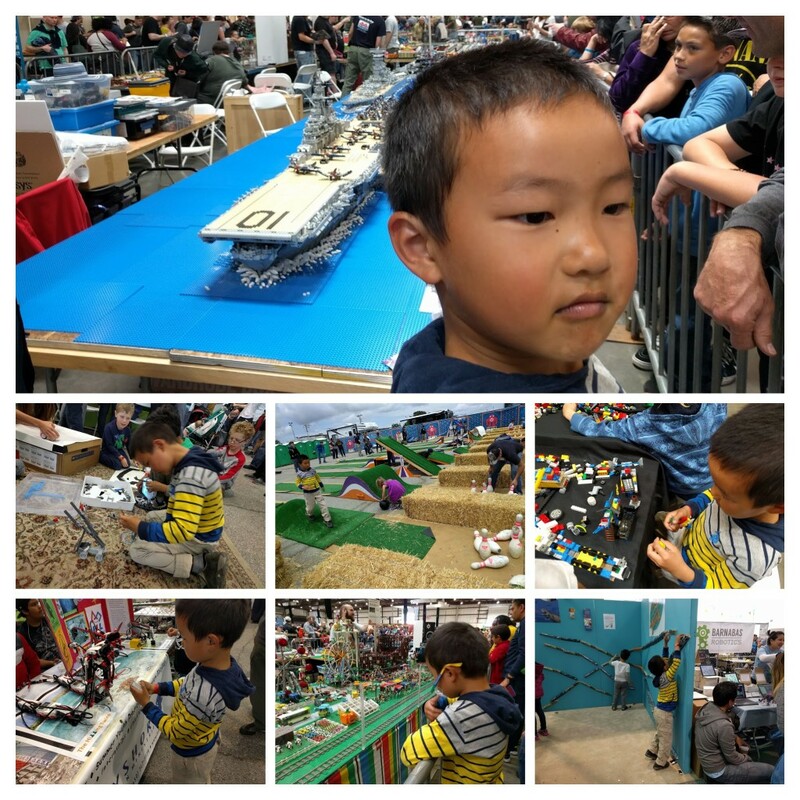 ZM took Noah to visit a friend’s booth. I went back to the door to get us wristband. We didn’t get the child tracker since there were two of us and Noah is in general a cautious kid who won’t run off on his own. Later we realized that we should have make a round through all the big company sponsored booth to pick up freebies. There were some googlers giving out protective goggles at the door (we entered from South Gate/Zone 1). That became the only schwag we got for the day. Later in the day we saw some people carrying this black nylon sack with Intel logo. ZM went by their booth and found out it was long gone. Initially we wondered around and let Noah decided what he liked to watch and play. 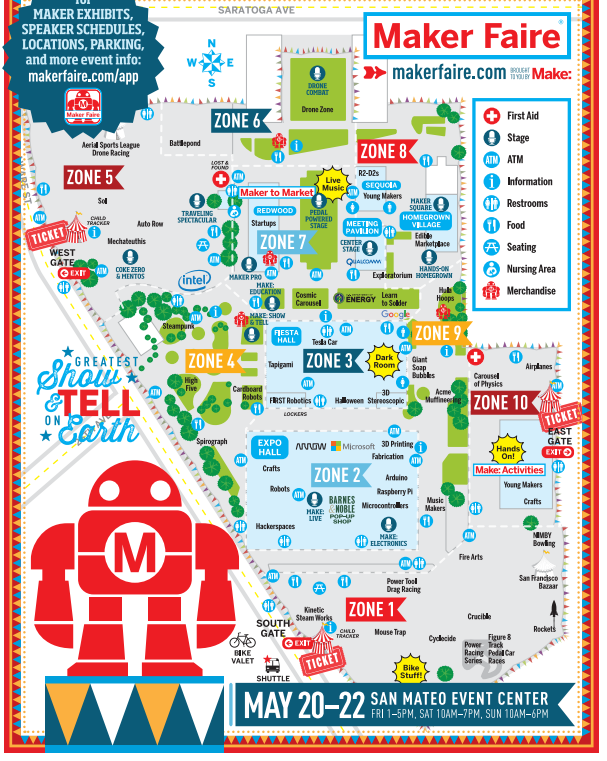 As a result, four hours into the day, we still haven’t made past Zone 2! While Noah was building his little lego battle ships, ZM went off to explore the rest of the ground. Reporting back how many great stuff we haven’t seen, Mi dragged Noah off to get more over-stimulations and sugar rich food. We did a whirl-wind tour of the remaining ground in another 2 hours. It was 4:15pm, 6 hours after we arrived. Noah still didn’t want to leave. But he was noticeably tired and getting cranky. We half threatened half coerced him out of the place. ZM carried him on his shoulder to the train station. We longingly looked at all the people who got on the shuttle at the door. Next time! 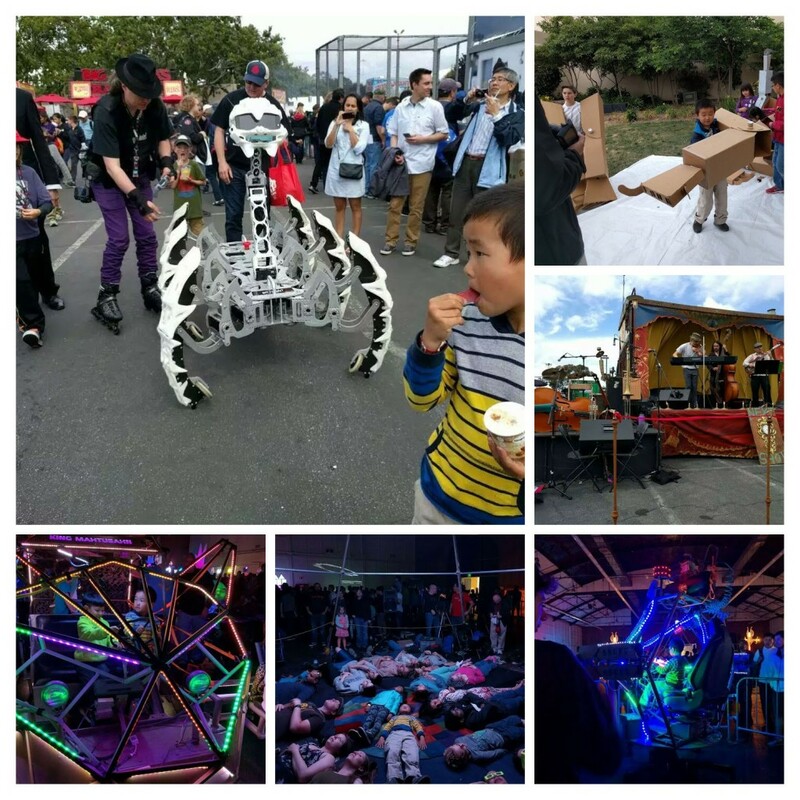 Noah’s favorite activities: paper trax, building cars, NIMBY bowling, Lego models of aircraft carrier, building his own lego battle ship, Dark Room activities, Spider robot, Drone racing, cardboard Robots. We didn’t go see the battlepond cuz we got there late and the line was super long. This entry was posted in Family, Local Colors by Jean. Bookmark the permalink.